Sweet, juicy, plum shaped, eye-catching, bright yellow fruits, ideal for a colour contrast in salads, as well as in ketchups or soups. 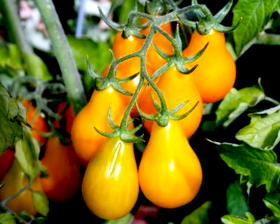 Tomato Yellow Pear is best grown outdoors or in large containers. Height 135-150cm. Germinate at 20-30C on the surface of a good free draining, damp seed compost. Place in a propagator or seal container inside a polythene bag until after germination which usually takes 7-14 days.